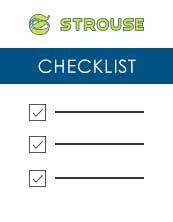 At Strouse, quality is a main focus of our operation. We pride ourselves on efficient and effective processes to create quality products. It’s the main reason why we’ve been able to achieve many certifications from suppliers and ISO registrars. At Strouse, quality is a focal point. A total process which encompasses all facets of the organization. With a Quality Management System registered to the ISO 9001:2008 standard, a great deal of emphasis is placed on continual improvement. FMEA's, PPAP's, and DOE's are a standard part of the development and production process within Strouse. Before we receive materials from any given company, they must first pass the Strouse supplier certification which incorporates a number of critical elements that impact the overall quality and success of a product. Before operating at maximum efficiency within our plant, pressman will first produce samples for the quality inspectors where they are tested and approved. Products are continually inspected throughout their production run using in-line vision systems to quantify the data in real-time. Work instructions and inspection criteria are constantly revised for continual improvement. Prior to shipping the products, they go through a final inspection to ensure the products are labeled correctly and that all necessary paperwork is included with the packaging per the customer’s request. Strouse has several machines which operate in a Class 10,000 (ISO 7) clean room. This ensures that both temperature and humidity are at a constant level and limiting the number of airborne particles in the environment. From beginning to end, everything produced at Strouse is supported at the highest standards possible and our employees take the planning and development stages very seriously to ensure we efficiently produce the finest adhesive products in the industry, for you. We take pride in each of these certifications. They are a testament to the foundations of our business and the processes we have in place. Our attention to detail is what allows us to excel in many different industries; solving problems you thought couldn’t be solved.